Making decisions quickly and accurately? Getting your lab results faster? Are these some of your daily challenges? bioMérieux provides diagnostic tests that support clinical decision-making. Getting the right information at the right time to make the most relevant patient care decision is a constant challenge for healthcare professionals. Rapid, high medical value tests and faster lab-to-ward transmission of patient results can play a key role in helping you meet that challenge. contribute to patient comfort and cost-savings by avoiding more invasive and costly investigations. Diagnostic tests support rapid, efficient risk stratification for ED patients. If you could get faster delivery of results from lab to ward, what would that mean to you ? It could well mean faster, more confident patient-care decisions. It could also mean earlier initiation of relevant therapy, adjustment of empirical treatment, and more rapid patient isolation. Did you know that innovative diagnostic solutions are now cutting result times in half ? And IT solutions are now connecting lab systems to help get results back to you up to a day earlier? 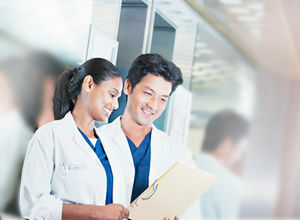 Innovative, web-based laboratory informatics provide timelier, actionable results, by connecting diagnostic systems with centralized lab computers. Our wide range of diagnostics tools and solutions offers valuable support for clinical decision-making. With extensive experience in the development of high medical value tests, we provide physicians with results they can rely on to make the most relevant clinical decision for optimized patient outcome. Righini M, et al. J Thromb Haemost. 2007;5:1869-7. Ten Cate-Hoek AJ, et al. J Thromb Haemost. 2005;3:2465-70. Uzzan B, et al. Critl Care Med. 2006, 34(7):1996-2003. Schuetz P, et al. Clin Infect Dis 2012;55(5):651-62. *** VIDAS® B.R.A.H.M.S PCT™ supports the clinical management of sepsis, and procalcitonin cut-off thresholds are an aid to the clinical management of lower respiratory tract infections, but under no circumstances replace clinical judgment and thorough clinical assessment of patients.